The term “local site effects” is used to describe not only the potential effects of the soil stratigraphy, but the effects of the topographic irregularities and of the geomorphic conditions as well. The latter, usually characterizing an alluvial valley, tend to modify the amplitude, the frequency content, the duration, and the spatial variability of seismic ground shaking. 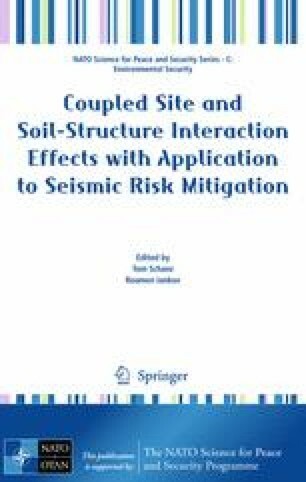 The current study aims at shedding some light on these important issues by analyzing numerically the effects of the sub-surface geomorphic conditions of a valley on its ground surface seismic motion. Two-dimensional linear ground response analyses are performed to study an alluvial valley in Japan, the behavior of which has been monitored during many small earthquakes in the past. Additionally, equivalent-linear ground response analyses for the valley show that the potential soil nonlinearity (due to hypothetical strong shaking or highly nonlinear soil behavior) may reduce substantially the observed valley effects. Finally, as a road bridge founded on the valley has also been extensively monitored, special emphasis is given on the numerical simulation of the distress of its pile foundation and of the dynamic response of the superstructure.